Easter was always one of the four or five times mom would drag me to church every year. She would wear an Easter Hat and bright clothes, usually the color purple played a big part. We would decorate the house, have colored eggs and eat chocolate. The tradition has continued at my home. My wife T puts up ceramic bunnies, colors eggs and makes baskets for everyone. As I started to reach for what I thought was the candy egg I heard a loud bird screech and a bird dive bombed me. It looked liked a scene from the 1960s movie THE BIRDS. Could it be that these are real bird eggs, what are the chances a bird lays eggs a day before the Easter holiday? 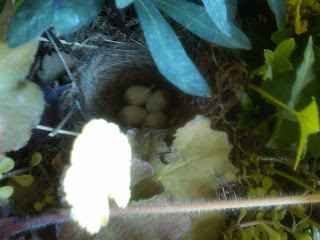 I stopped short of touching them and called my wife, assured that she had planted them there. She said that she hadn’t. WOW a little Easter Miracle….see the picture for yourself.